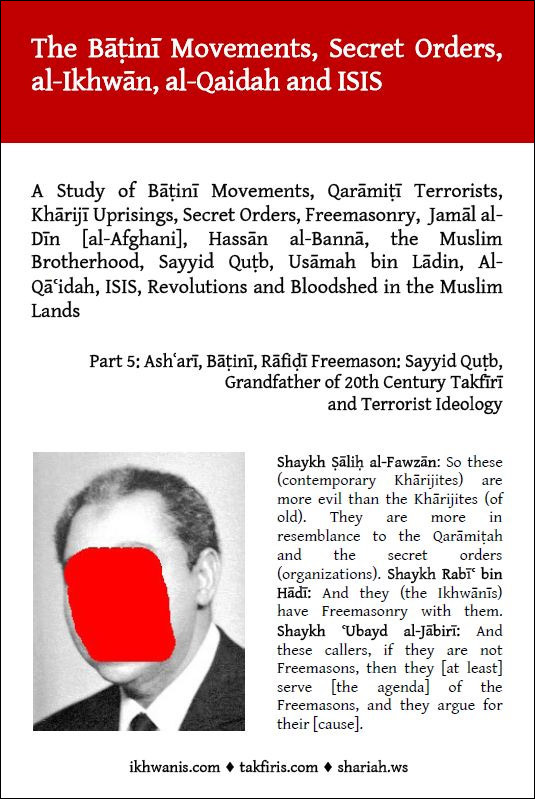 A multi-part series taking an in-depth look at the early Baatinee movements which were set up to contend and fight against the ruling authorities of Islaam, their continuation through the ages into the 19th and 20th centuries in the form of secrecy-based political Baatinee-type movements operating as "Islamic revival" parties utilizing the same slogans and ideas as their predecessors in Baatiniyyah (social justice, freedom, equality). Some of them were heads in Freemasonry, such as al-Afghani and Sayyid Qutb, and carried the poison of the Raafidee Baatinees in their views towards Uthmaan (radiyallaahu anhu) and the Companions (radiyallaahu anhum). These organizations have become proxies in effect for external foes who wish to manipulate and control the internal politics and economies of nations, and millions are deceived by these jamaa'aat who use lofty slogans in the name of Islaam. All of these movements operate upon an ideology which derives from a Marxist, Communist interpretation of social injustice and they abandon the divinely-revealed texts which provide a totally different understanding and interpretation. As such, these jamaa'aat stray far and wide from the methodology of the Prophets in rectification and simply adopt, the slogans, ways and practical means of the revolutionary movements that were erected by Freemasons to wrestle power and wealth from the monarchies of Europe. The Muslim Brotherhood is Freemasonic type organization being used for the same objectives in Muslim lands and many of their leaders are heads in Freemasonry (Sayyid Qutb, Hasan al-Hudaybee, Mustafa Sibaa'ee). This series will give you an eye-opening overview of history, connect all the important pieces and give you a glimpse of the type of (political) deception that Dajjaal will come with when he appears amongst the armies of the Kharijites as occurs in authentic texts (see here).